Leading Light Communist Organization supports the growing tide of anti-American sentiment, protests and actions throughout the Muslim world. Although the initial spark for the protests and actions appears to be a sensationalist, vulgar, anti-Islamic film made in the United States, the anti-imperialist anger that drives the masses to protest has very real, material causes. 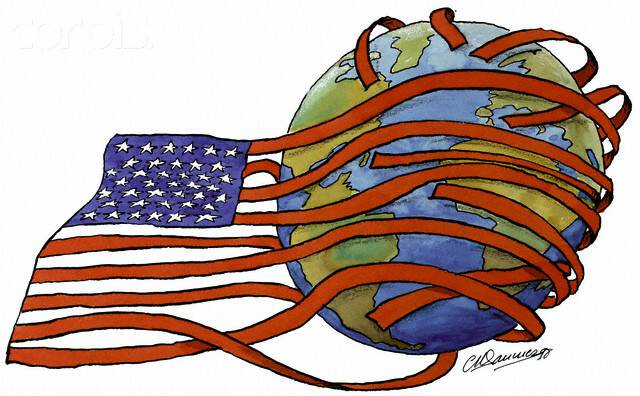 The United States and other imperialists have been waging a global war against the Third World, including the Muslim Third World. Supporting the growing tide of anti-Americanism on the Muslim street even when such protests are not led by proletarian, Leading Light Communist, forces, is part of upholding the worldwide united front against imperialism. The Leading Light stands against imperialism everywhere. The Leading Light Communist line continues to be “uphold the broad united front against imperialism! Hold the Red Flag high!” In other words, support all those resisting imperialism, while at the same time express criticism and contend for leadership where possible. LLCO will have more to say on these events in the coming days. Across the world people are standing up and saying no more to all the injustice that inequality has wrought on our world. Protesters are taking to the streets from Bangladesh to Libya. They are expressing anger about real world problems. They are not simply wild-eyed fanatics as the racist media would lead you to believe. Islamophobia is a real problem, common among the First World right and “left.” And the video is part of this bigger problem, but the anger even runs deeper. These are people who understand that there are big problems in the world. Many see that rich countries of the West, the United States in particular, have been waging wars on the poor countries, especially those in the Muslim world. A low quality, racist, anti-Islamic video is a rallying point for people, a point of unity on the streets, but it is not really what the protests are about. The problems are bigger. The protesters are bigger. The anger is bigger than that. The United States has been attacking poor peoples since it was founded. This war is ongoing. Sometimes its weapon is economic war, sanctions, or the USA uses its market power to cut those disobedient to its aims out of the market, or it destroys local economies by flooding them with cheap goods, thus undermining local manufacturing and creating maldevelopment. It uses its power and influence to get countries to sign away their future by locking them into a debt prison from which escape is nearly impossible. The USA is an economic powerhouse. Ir brings all its economic muscle to bear on the it opposes. Or, the USA uses covert war. The USA finds proxies and mercenaries to attack the Third World peoples that it has problems with. It sends in highly-trained assassins to kill high-profile scientists, leaders, etc. It uses death squads to terrorize communities. Sabotage is used. Or it sets up contra armies under NATO protection to cross borders with hit and run attacks. Or the USA in the most cowardly fashion simply bombs its enemies, enemies who can hardly defend themselves from the USA’s air might. Or, the USA destroys a whole society, then attempts to arrogantly build a new society from scratch in the place of the old. They bomb, invade with ground forces to mop up and destroy anything missed, then they begin contracting out the rebuilding of the country in the image of the USA. Or the USA exterminates its enemies through genocide. It bankrolls the Zionist murder of Palestinians, or Kurds in Turkey, etc. The USA uses cultural war to rework, or if need be, replace, indigenous ideas. All of this must be seen as a large war against poor peoples of the region. It is an endless war against the Third World. Day in day out. Year in and Year out. Decade after decade. It does not matter what has gotten the poor peoples to initially stand up against the United States. The point is that they are voicing their deeper concerns, their righteous anger. If the USA did apologize for the racist video, as some clerics have demanded, would that matter? Not really. US culture produces an endless stream of offensive material. Far more offensive than the video is the mass murder of poor peoples, including most Muslim peoples. The genocide against the Palestinians won’t go away with an apology about a video. The destruction of Afghanistan, Syria, Iraq, etc. will not stop. An apology will not stop the murder of Pakistani weddings by drones. It will not stop the kidnapping and torture of Muslims in secret prisons. The racist crusade against the Muslim world will not stop with an apology. Chauvinism, wars, poverty, cruelty, etc. all the madness of this world, will not stop until we act. The horror will not end until poor peoples in the Third World act to free themselves, to build a new world, a world of peace, a world of respect, a world of Global Equality. Taking to the streets is a step in the right direction. We stand in solidarity with those standing up against Western, especially American, imperialism.